Life and this pregnancy had been pretty uneventful recently (work, house renovations, signing up for baby classes) ... until last week. On Wednesday morning, I awoke to a gush of blood. This is the third time (!!!) that this has happened to me and it never gets any less scary. I called the answering service for my OB and the on-call doctor told us to go to the maternal assessment area at the hospital where we were planning to deliver. Longest ride of my life, but baby gave some reassuring kicks on the way. After normal vitals, etc, my doctor (who happened to be at the hospital that day) stopped by and explained they would be doing a variety of tests (blood work, ultrasound, contraction and heart rate monitoring) and that I would be given steroid shots to help baby's lungs develop (just in case he needed to be delivered) and also magnesium sulfate to help prevent neurological issues (again, just in case). It was a bit of a whirlwind in the room and I felt suddenly that things were more serious than I had initially thought. I'm only 27 weeks ... there should be no discussion of delivering. But it was clearly on their minds since I was not allowed to eat anything in case I needed an emergency c-section. She also mentioned that with the meds, they like to continue monitoring for several days, so I knew there was no going home that day. Baby's heart rate was perfect and he didn't appear to be in any distress which was a relief, but I was having contractions every 3-4 minutes. They felt like more intense versions of Braxton-Hicks ... uncomfortable tightening in my uterus. From what I had read, these didn't seem like the real thing to me, and to be honest, I hadn't even really noticed them or their frequency until they hooked the monitor up. The magnesium sulfate was brutal. It literally made me feel like my body was on fire. They do an initial quick infusion and then slow it down for the remainder of the day. After they slowed it down, the burning feeling faded a bit, but I was still excessively warm and felt increasingly weak for the remainder of the day. By the time they turned it off, I felt so puny that I was having a hard time getting my eyes to focus. So all the tests were done and my doctor came back in to tell me they were going to transfer me to a different hospital where they have a NICU which can handle babies born at 27 weeks. The hospital I was in typically only handles cases after 32 weeks. Again, the helpless feeling of "what is happening?!" and also additional fear because I would have to be separated from Mike for the trip. I cried. To be honest, I'm crying now too because in the moment it's difficult to process your emotions. We signed the paperwork and I made the 20 minute ride via ambulance to a hospital downtown. I was so glad that Mike beat the ambulance to the hospital ... it was comforting to have him there waiting for me. I got set up in bed with the IV and all the monitors and waited for the doctors. At some point I also made a trip to the restroom where I noticed that the bleeding appeared to have stopped! I took this as an optimistic sign. A whole hoard of doctors finally came in (teaching hospital, I guess). The tests that had come back from the other hospital were all good. They were just waiting on one last test which shows the level of baby's blood in my blood. My uterus was still contracting very regularly, but my cervix was hard and closed, so a good sign. Baby continued doing great ... totally oblivious to everything going on in the outside world. In fact, I felt he was being more active than usual ... or perhaps I could just feel it more because they had the monitors strapped on with very tight belts! At some point after that, the high-risk doctor came in to talk to me. She said they were thinking that I had a placental abruption which is where the placenta tears away from the wall of the uterus. The test from the other hospital had come back and showed a higher level of baby's blood in my blood than is normal. This caused them to be more concerned and she said I would probably need to be monitored for several more days. They did finally give me the ok to eat!! Hunger combined with the IV were making me feel even more miserable so this was a welcome development. I was also having a hard time internalizing things they were saying to me, so was hoping food would help. Of course, all these other pop-ins by doctors after the first hoard occurred when Mike had run home to get some things for me and take care of some work stuff, so I didn't have an additional listener to help and ask questions ... I did my best! The rest of Wednesday was spent on the IV and with the monitors strapped on. It was a long, long day, but the bright red bleeding had stopped and baby continually reassured me with lots of flips and kicks. After the magnesium sulfate was finished, I was feeling noticeably better within 30-45 minutes. Well enough, even, to log in to work to let my manager know how things were going and the plan for the next few days. She was very understanding which put me at ease ... I didn't need to worry about work at least. Before bed, the nurse also advocated on my behalf to stop my fluid drip and remove the monitors for the night so I could get some better rest. She also offered some medicine to help a bit with sleep and anxiety which I resisted at first, but eventually took around midnight or 1 am because my mind was racing and analyzing the events of the day. After that, I got about 5 hours of restless sleep which was better than nothing. Around 6:30 am, the nurse came back in to hook me up to the monitors (I would be monitored for 1 hour, 3 times a day) and to give me the second steroid shot. Shortly after, an ultrasound tech from the high-risk doctor's office came in to give me another longer ultrasound. 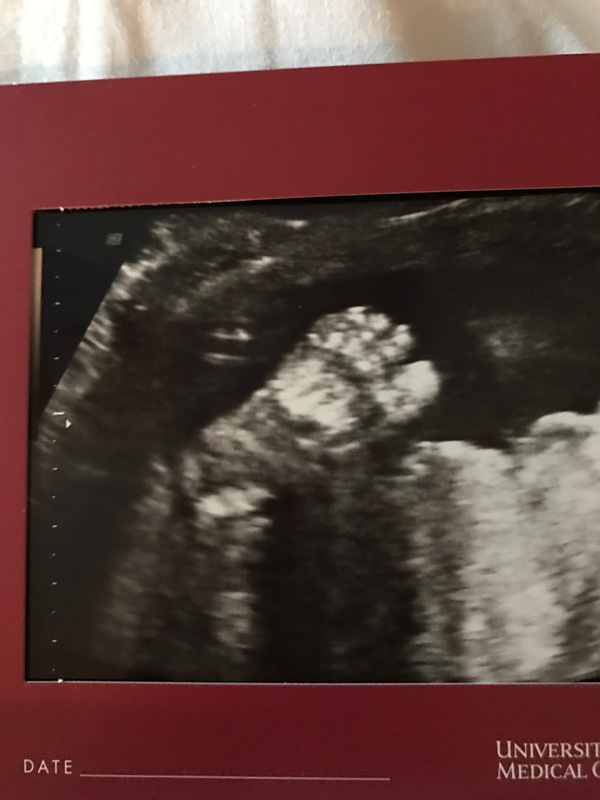 In addition to a growth report, the doctor had also requested a biophysical profile which looks at baby's movements in the womb to assess their well-being. The technician cautioned that it could be hard to get a BPP on a baby so young, but I'm proud to say our baby got an 8/8 for being a little acrobat on camera :) My amniotic fluids were a little on the low side, but had increased a bit by the end of the ultrasound because baby had peed (ha!). All the other growth measurements looked good too. His estimated weight is 2 lbs 4 oz and his overall growth is in the 47th percentile for his due date. His head was actually measuring at 30 weeks and a few days, so I'm just going to assume that he has a really big brain. Of course, he had his hand over his face. The tech gave me a pic of his foot instead. My main doctors came in around 8:30. They thought the ultrasound results were good. They could not see the placental tear on the ultrasound which I took to mean that it wasn't super large. They continued to be concerned because of that blood test result and because my uterus still seemed to be pretty irritated: I was still contracting every 15 minutes or so. They said this was normal with bleeding but they wanted to be cautious, so I would be moved to a different room (I was still currently in labor and delivery which by the way, has the most uncomfortable beds!) and monitored for another day. So I was moved to the antepartum area which is where, as the nurse put it, "they keep people pregnant". The room was much bigger and the bed was much more comfortable. I was able to take a little nap before social work came in and wanted to chat about support and emotions ... she was nice, but I was out of it and wanted to sleep more. The rest of Thursday was thankfully uneventful ... just more monitoring and resting. I took the same sleep med Thursday night and slept like a rock for 5 hrs. Friday morning I was up at 5 am or so. The nurse had told me she would come in to hook me up to the monitors and do vitals around 5:30, so I just stayed up. I was anxious to see the doctors that morning to see if they would let me go home. Still no more bleeding, baby was doing great, and my contractions had slowed down a lot. Usually the doctors round early, but on this day, they didn't get to my room until 10:30. The high-risk doctor told me that they had called the lab to discuss the results of the fetal blood level test because upon further review, they felt that the results from the lab were worded ambiguously. It turns out that the level of fetal blood in my blood was within normal range! I asked if this meant I didn't have an abruption, and she said that they still thought that was the cause of the bleeding, but that the normal blood test indicated that it wasn't as bad as they had initially thought. What a relief! So I would get to go home! No bed rest (because bed rest isn't proven to work ... glad to have doctors who believe in fact-based medicine), but I should take it easy. And she recommended another growth ultrasound in 2-3 weeks. We made it home around 1 and I took a long nap. This week I already had a doctor appointment scheduled for my gestational diabetes test and Tdap vaccine, but now I have an additional appointment for an ultrasound on Friday, and my regular doctor wants to do ultrasounds every 3-4 weeks from here on out. I'm still super paranoid but trying to stay positive. Baby has proven he is a champ and it's his mama's body that apparently doesn't like pregnancy. But I'm going to do my best to keep him baking for as long as I can! You are freaking AMAZING!! Wow, what a scary episode, but you held it all together and are staying positive. I love you! I am sorry your pregnancy has been so tumultuous. Please, please, please tell me how I can help!